Experience life through the eyes of seven-year-old Agatha, an insomniac who finds herself conflicted between friendship with the animals in her mother’s butcher shop and her unwavering love for eating meat. Embark on a satirical narrative point-and-click adventure as you go on an unpredictable journey through Agatha Knife’s quirky and hand-crafted world. Aiming to make the animals unafraid of their inevitable fate in the butcher shop where Agatha works, you’ll head into the whimsical Psychotic Universe looking for answers. Upon her discovery of religion, Agatha quickly realizes it could be used as a valuable tool to win over the animals, quash their fears, and make them unafraid of death. Join Agatha as she undertakes the challenge of creating a new religion of her own, Carnivorism, and works to convince the animals that the sacrifice of their flesh is the secret to eternal happiness. Taking place in the same world as Mango Protocol’s first title, MechaNika, Agatha Knife is riddled with dark humor, geek references, and challenging puzzles. Utilizing humor and wit to boldly explore controversial issues, players will find themselves immersed in Agatha’s struggles while experiencing the world through the eyes of a naive child. Agatha Knife was released on April 27th this year. The game didn't get much visibility but so far it has been very well received by press and users, achieving a 98% of positive reviews on Steam. They have enjoyed the weird and fun story of the 7 yo butcher creating her own religion, the cute and colorful art style of this Psychotic Universe, and the lighthearted and catchy melodies of the original soundtrack. Finalist in Best Music Awrad in Gameboss 2017. The other nominees were two amazing games: Aragami and Candle (winner). Finalist in Best Music and Audio Design Award in Gamelab 2017. The winner of this award was the outstanding Rime. Finalist in Diversity Award in TIGA Awards 2017. Some of the other nominees were Horizon Zero Dawn, Herald, and Women in Games (winner). 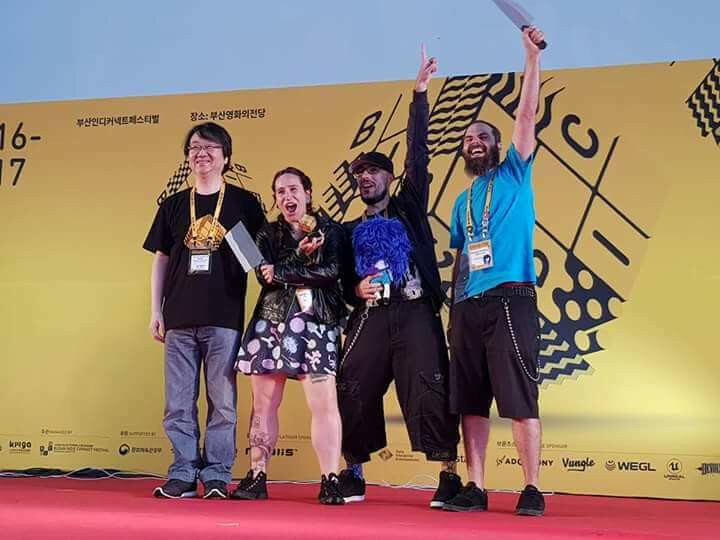 Winner of the Excellence in Narrative Award in BICFest 2017 (YAY!!!). Old Man's Journey and our very good friends from Appnormals Team with STAY were also finalists. We use pop culture and geek references in Agatha Knife, including movies, music, anime and video games, as a narrative device (and because reasons). We review the art pipeline we worked with during the development of our second Psychotic Adventure, Agatha Knife.